A team from the Faculty of Physics, MSU together with their foreign colleagues developed a new liquid crystal material with high potential as a basis for brighter, faster, energy saving displays with higher resolution. The results of the work were published in Advanced Functional Materials journal. The LCD devices can be found in almost every home. The most simple ones are the watches, calculators, and players, and the more advanced level is represented by the screens of computers, smartphones, tablets, TV sets, and other electronic devices. The display images consist of many pixels – the smallest physical elements of a liquid crystal display. Each pixel of a conventional LCD based on the nematic liquid crystal (NLC) is combined of the three subpixels: red, blue, and green. An LCD material within each pixel is, in fact, a color filter forming a sandwich-like structure, in which the "filling" is formed by the two glasses with transparent electrodes inside and a liquid crystal between them, while the outer parts of the "sandwich" are the polarizers. Both polarizers produce the linear polarization of light, but in perpendicular directions. Each pixel of a conventional display is filled with NLC having perpendicular orientations of molecules on the opposite glasses (see the picture on the left). The first polarizer produces the linear polarization of light in particular direction. Without electric field, the polarization plane of the light rotates by 90 degrees passing between the glasses, so that the polarization plane on the output of the cell coincides with the polarization plane of the second polarizer. In this case the light propagates through the cell, and the pixel is bright. When the electric field is applied, all molecules are oriented along the electric field (see the picture on the right), there is no rotation of the polarization plane of the light between glasses, therefore the second polarizer cuts-off the almost whole light propagating through the cell, and the cell is dark in this case. The color in the conventional displays is formed by illumination of each particular sub-pixels by red, blue or green, while the liquid crystal within each pixel is either transparent (if the voltage is off) or absorbing (if the voltage is on) for the light. In the end, the colored image is formed by a particular combination of the red, blue and green subpixels.. This principle was elaborated by the Soviet physicist Vsevolod Frederiks and is currently used in the majority of LCD devices. 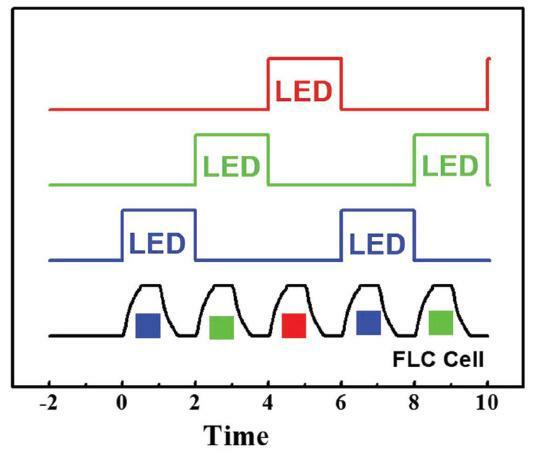 "We've developed a liquid crystal material of another kind – a ferroelectric liquid crystal (FLC), which is stable to the mechanical stress (the major problem in FLC's). FLC possesses the spontaneous electrical polarization that allows one to enlarge the order of the operation speed several times of magnitude. FLC materials allow one to use the field sequential color display, in which the red blue and green light are averaged by the human's eyes in time, but not in space," says Alexander Emelyanenko, Professor of the Russian Academy of Sciences, Doctor of Physical and Mathematical Sciences, and leading research associate of the Chair for the Physics of Polymers and Crystals, Department of Solid State Physics, MSU. The material developed by the scientists has the stable FLC structure in a wide range of temperatures which makes it resistant to temperature fluctuations. In new displays all three backlighting colors can be activated in a certain quick sequence across the whole screen, while each liquid crystal pixel can be "opened" and "closed" faster. Experiments have shown that the replacement of the three subpixels with the only one will allow the audience to enjoy a more realistic, contrast and bright images without the color blurring. Conventional LCDs based on NLC absorb about 2/3 of the backlight due to the use of three separate color filters that are in-built into the structure of a display for creating a full-color image. Such displays require more powerful light sources. In new displays each pixel will be open for the light propagation during particular time, which is needed to mix the colors in time. "The development of the field sequential color displays will make their production considerably cheaper and improve their optical characteristics such as brightness, color gamut, and resolution (as each pixel will work on its own, not as one of the three subpixels). This will also help save up to 70% of energy consumed by a display, as the source of light may be made much less bright without affecting the brightness of the screen," concludes Alexander Emelyanenko. The work was conducted together with scientists from the University of California, Berkeley, and the National Chen Kung University (Taiwan).